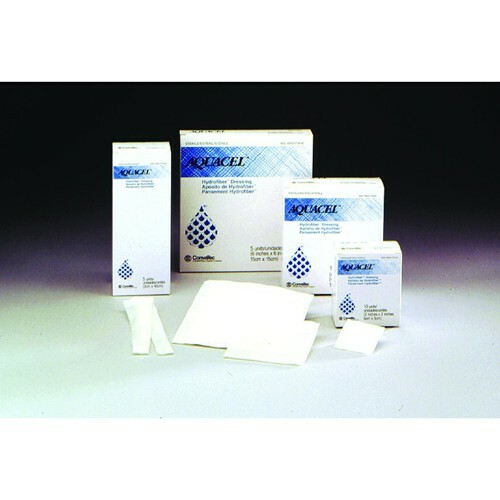 Aquacel Dressing Hydrofiber by ConvaTec is a wound treatment dressing that provides a complete moist wound healing environment for optimal wound protection, debridement and easy removal. This innovative wound treatment is composed of sodium carboxy-methylcellulose fibers for the healthy management of exudating wounds. Aquacel Dressing Hydrofiber by ConvaTec is soft and nonwoven to create a healthy and moist wound healing environment. Comfortable and highly absorbent, this wound dressing is sterile, making it ideal for a variety of different types of wounds. You might also be interested in similar wound treatment products that we carry, such as Skin Prep Wipes by Kendall. Maintains a moist wound environment for optimal healing, debridement and easy removal. Innovative dressing composed of sodium carboxy-methylcellulose fibers for the management of exudating wounds. Soft, nonwoven, conformable and highly absorbent. Aquacel can be used in dry wounds to provide moisture and wet wounds to absorb moisture. It is very versatile. It can be cut-to -fit without difficulty. It is a great product for wound healing!